This website as stated pretty much in the title is all about textures. Textures are great because they can be used to liven up backgrounds, 3D models and just about everything else. The website I am talking about is Cg Textures. 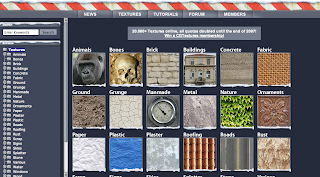 Its a very big directory based site that gives you access to lots of free textures. Free being the best word in the previous sentence. The quality and use varies between sections. Some images are really good quality some, lack the brilliance of some of the photos. But you can't beat free. There are a couple of catches. For example at the moment you are only allowed to download 30mbs of images a day. Its 15mb starting the new year. I think they have done this to stop people mass downloading hundreds of files. Its a small catch but I think they have our best interests at heart. Anyway to round up. CG Textures if definitely worth a visit. You may need to dig deep to find the good quality stuff.